Even the most robust water repellent surfaces that are found in windshields, boat hulls and power generators have a tendency to give way under extreme conditions. Conditions such as increased pressure and high temperatures cause these materials to fail-until now. A group of scientists at the Brookhaven National Laboratory in New York have found that in the world of water repellent surfaces, size and shape really do matter. 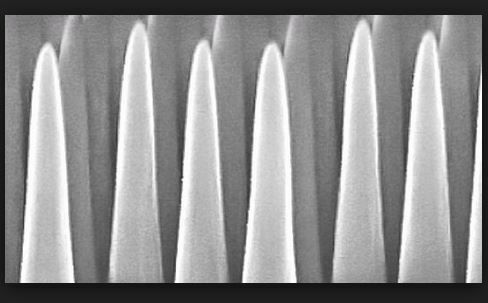 The scientists in collaboration with the division for functional nano-materials have developed a stronger hydrophobic material using microscopic textures otherwise known as nano-structures. Lead author and physicist Antonio Checco explained that “the idea that microscopic textures can impart a material with water-repellent properties has its origins in nature.” Drawing on the hydrophobic properties exhibited in certain leaves and exoskeletons of insects led the team to investigate how various shapes and sizes of nanoscale textures could affect how water resistant a surface is. Prior to this study, researchers have found it difficult to control the surface texture geometry over larger areas. A big breakthrough that made the experiment possible came from the development of block-copolymer based film patterning. The scientists were then able to conduct a study that examined how water interacted with two different 20 nanometer wide surfaces. One surface was comprised of cylindrical shapes, while the other was made of angle-cones. 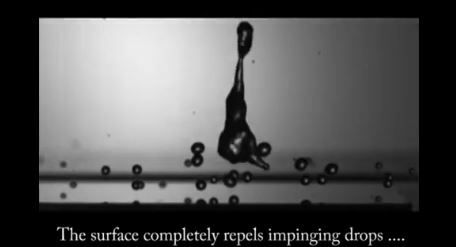 Interestingly, the cylindrical nanostructure repelled water, but retained microscopic amounts of liquid on its surface, while the conic structures caused the water to ball up and bounce off of its surface. There was no water retention even after water was applied at high speeds of up to 10 meters per second. This study enables researchers to further study how resilience to liquid depends on a nanostructure’s texture size and shape, while the technique they have discovered can be extended not just into properties for sensing DNA presence, biotoxins, and proteins; but also to practical applications like glass manufacturing for windshields or protection for boat hulls. While this study can have multiple uses, it is just one way in which nanotechnology is helping to shape our future. It is also being used in experiments from solar to sensors. The study was published yesterday in the recent edition of Advanced Materials. For more information on this particular study you can visit the Brookhaven National Laboratory.